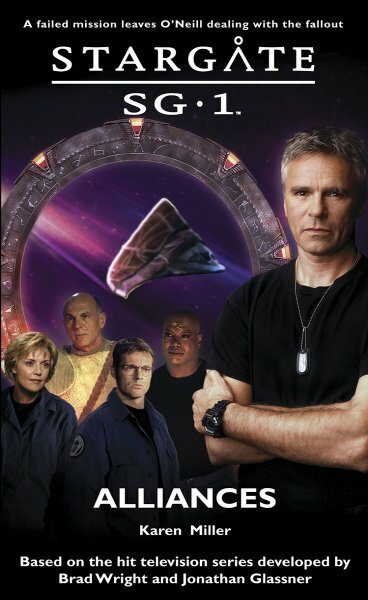 All SG-1 wanted was technology to save Earth from the Goa’uld, but the mission to Euronda was a terrible failure. Now the dogs of Washington are baying for Jack O’Neill’s blood — and Senator Robert Kinsey is leading the pack. When Jacob Carter asks General Hammond for SG-1’s participation in a mission for the Tok’ra, it seems like the answer to O’Neill’s dilemma. 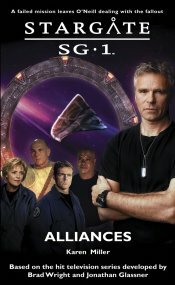 The secretive Tok’ra are running out of hosts, and Jacob believes he’s found the answer — but it means O’Neill and his team must risk their lives infiltrating a Goa’uld slave breeding farm to recruit humans willing to join the Tok’ra. There were no amenities in the stone room they were left in by Va’ton and his Jaffa subordinates. No benches. No blankets. No pillows. Typical Goa’uld hospitality. There was, however, a big messy dried bloodstain on the prison cell floor. Daniel wasn’t going to think about that. He took off his shirt, bundled it up, and put it beneath Jack’s lolling head. It wasn’t much but it was better than nothing. God, he was hungry. Light-headed. More than a little shaky. The cut on his hand had long since stopped dribbling but it still hurt. He was reasonably sure it was infected. Which was nothing compared to the trouble they were in. Standard O’Neill reply: Don’t worry, Daniel. We’ve been in worse. Okay. Maybe. Once. Sitting in a corridor covered in blood, having just been shot to bits by a Jaffa staff weapon, on a mother ship rigged to the rafters with C4, knowing his wound would probably kill him first, knowing Jack and Sam and Teal’c were going to die soon, too. He’d survived that one. So had they. But even cats only got nine lives and he wasn’t a cat. How many times could he tap-dance on the brink of death before that final, fatal plunge? Please God. Let us be rescued soon. Jack liked to say, There is always, always a Plan B.